Latte Art Printing Machine – how to build one! In this video I print out Starbucks logo for fun. At the very end of the video, the copyright sign gets printed on the edge of the cup. So the question is, how can you build a system like this? 1) An old flatbed plotter (in my case it was Philips 8155) – make sure it has real x-y translation stage. Your best bet is to perform a search on eBay for flatbed plotter. On a good day, you may get a decent fully working plotter for under 100$. I got mine for 175$ with shipping, because I wanted A3 format for later use, and a bunch of pens. 2) Most old plotters connect through GPIB/Serial interface -mine connected through GPIB interface, so I needed a GPIB card, which I also got on eBay. I got my card for around 30$, because the one I purchased was not a popular kind (LTP1 – GPIB). 4) A small 12V relay (my plotter lowers pen by applying 12V to the solenoid). This relay will enable the stream of ink from the inkjet cartridge. 5 ) Edible ink – preferably brown. You can work with coffee directly instead of ink, but the contrast is not as good as with ink. Again, I got mine on eBay. The image of the king is taken from David’s Bellot SVG cards site. This is super cool! There are so many different food things you could plot on! Cookies, Cakes, Beer! That’s pretty amazing! We need more of these kind of unnecessary little inventions that make the world more interesting as opposed to more practical. Hi there, i work at starbucks and i had a similar idea of doing this, its great seeing this in action although by the time its finished the foam can deterierate, maybe you need to speed the process up a little to make it viable, i would really like to see one done in color, if you use coffee for the ink you should put a little milk in it to make sure the taste stays good, you probably already know this though, add a little mark to the edge of your mug and make a detector so you dont have to align the cup everytime, im interested in more information about this please give me an email!!! Your concept is both brilliant and *wrong*. That is, the idea of using for coffee art is… fraught with missing the beauty of a latte, poured by hand into patterns. The art in the foam on a latte is a hallmark, a way to show the perfect relationship of foam density (satiny and smooth) and espresso, and the way the liquids have been blended in the pour so that no stirring is necessary to get a delicious first sip. Your machine is clever, nevertheless. A faster model might even have applications other than as a curiousity. Listen, I don’t drink latte usually, but I could drink a lot of latte with drawings I like! Man, you’ll be a rich guy very soon! Your business is in the Look at the Future (http://lookatthefuture2.blogspot.com/) because we believe that’s a good business idea. If you want, you can leave a comment. I think this is an incredibly cool concept, but I agree with those who say this isn’t a Starbucks idea. Starbucks is a fast food concept: quick service and market saturation. Market it to restaurants and local coffee shops. Awesome idea but I think your promotion is a bit off. Starbucks is nice and all, however for this type of machine I would go more high-end on the spectrum of restaurants. Some thing more sit down and 6-10$ for a cup. As soon as your patient is through I would do self promotion in the form of live demos, and brochures. Trade shows are also a plus if you can save up money for a table. This is a great invention, but not for Starbucks or any other coffee house. There is NO need for customizable latte logos. 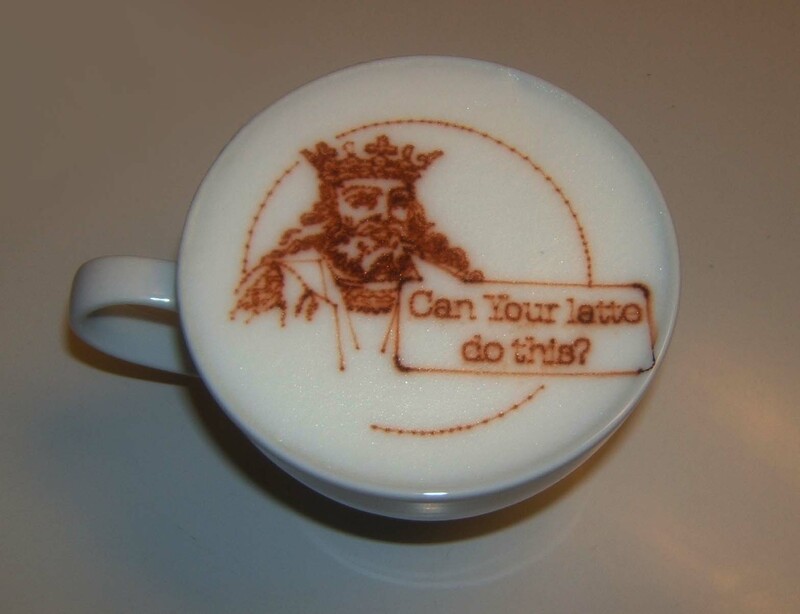 If they wanted to imprint logos on latte foam, all they need is a single metal “die” through which to push sugar liquid, or powdered cinnamon through in one shot, creating an image. That method would be cheap and take 5 seconds to use. Your method is what’s called “over engineering”. Great thing to geek out over, but not practical. Wow, im really impressed. You was in german television yesterday. Amazing idea! Do you sell the machine? I want to buy it. Please contact me. Looks wonderful, but by the time the printing is done, my latte will be cold? Great Art, fantastic – love it…..